WE NOW SELL FOLKMANIS PUPPETS! BOOK 1 NOW AVAILABLE FOR PURCHASE! BOOK 2 COMING SOON! WE NOW SELL FOLKMANIS PUPPETS!!! WE OFFER HAND PUPPETS, FINGER PUPPETS, STAGE and CHARACTER PUPPETS. CONTACT US FOR ALL YOUR CLASSROOM PUPPET NEEDS. MUSICAL MANIPULATIVES - BOOK 1 and 2! ALL THOSE GREAT MANIPULATIVE IDEAS HAVE BEEN PUBLISHED IN 2 NEW HANDBOOKS. INDEXES INCLUDE TITLE, STEADY BEAT, MELODY, SEASONAL and CHILDREN'S LITERATURE REFERENCES. CLICK TO EMAIL FOR MORE INFO OR TO ORDER YOUR MATERIALS: creativemusicclassrooms@gmail.com. CLICK THESE TABS FOR EACH PAGE SELECTION. This cute adaptation of the Eency Weency Spider invites children to join the bouncing pumping as he makes his way home on an Autumn day. My students have LOVED singing this along withe the spider version all month. It's a quick and easy, fun-filled, story that invites singing. To create a B Section, you will need 4 cut-out pumpkins (or four wooden painted pumpkin shapes from your local craft store). On each pumpkin, draw a single line and place a colored-in circle above or below the line. This will create a set of high-low pumpkins. Place magnets on the back for an magnetic white-board experience or simply use a pocket chart with a high and low pocket. 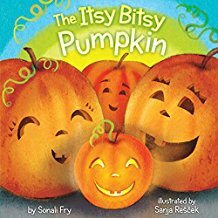 Place the four pumpkins in a line and sing the high-low pattern after each verse in the story (there are 2 complete verses in this board book). Invite students to move the pumpkins around to create new hgh-low patterns and sing again. The itsy bitsy pumpkin rolled down a spooky street. He passed a ghoulish ghost and stinky goblin's feet. Check back on Sunday evening or Monday for another classroom activity - this time from GR 4! Hope you have been successful with these past few weeks of postings. So I'm looking for a book that I could reinforce m-r-d patterns and still prepare low la. 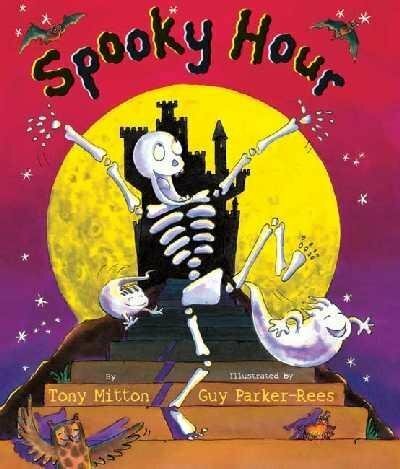 This book can be easily sung with simply m-r-d for the first three phrases of each "hour," then simply sing a reverse m-r-d pattern on the fourth phrase ending on low la. Between each hour, I used my d-r-m cards to have students sing various d-r-m patterns - creating a B Section as I turned the page to reveal the following 4-line stanza of the story. I have attached a recording of the melody that I'm using. It can give you an idea of what I'm working with -- If i get better at this, I'll redo and attach a better version in the next day or two for you to hear. CHECK BACK IN A FEW DAYS FOR MORE DOWNLOADS!!! As my second grade students are still working with half note and do patterns (prepare) - I am working with song selections and activities that allow for exploration of these concepts. While reading this story, I am beginning with a simply ta ti-ti rhythmic pattern that can be played on rhythm sticks (i.e. Day of the Dead - ta ti-ti ta rest). I will then change the rhythm pattern to include half note rhythms (i.e. 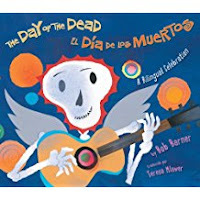 Dead, dead, day of the dead - long-beat long-beat ta ti-ti ta rest). CLICK HERE TO DOWNLOAD THE BONE ACTIVITY PATTERN. The book currently available through SCHOLASTIC for only $1, so many of my GR 2 students that have LOVED buying books to make music with in the past, have been bringing in their dollars to have their own copy. As we create new rhythm patterns using bones, students can cut out miniatures of the pattern and tape them into the story to create a play-along they can share at home. Find Children's Literature Selections on Amazon! Looking for something specific? Type here to search through my activities. CHILDREN'S LITERATURE: Books to Sing - Search the blog archive by date for an activity. A former Chicago music teacher, Thom Borden completed his Orff Master Level under Jos Wuytack and has studied music and movement in Europe. Continued studies included Kodály Training at Colorado State University and Silver Lake College with Sr. Lorna Zemke. As a former clinician and Music Consultant for Macmillan/McGraw-Hill and past-member of the National Association of Storytellers, Thom’s sessions incorporate a performance perspective. Affiliations have included MENC, AOSA, OAKE, the Association Orff France and the Alliance Française Chicago. Thom was a clinician at the 2004, 2007, 2008 and 2010 AOSA Conferences, 2008 and 2010 Early Childhood Music and Movement Conference, 2008, 2009 and 2011 OAKE Conferences, and the 2008 Australian Orff Conference in Melbourne. Thom is the past-president of the Chicago Orff Chapter and presents annually at many state educators’ meetings. He published selected Orff arrangements in the Macmillan/McGraw-Hill series, Spotlight on Music and is currently working as an independent music clincian and consultant. Thanks for Visiting My Blog! Come back each week for new ideas.